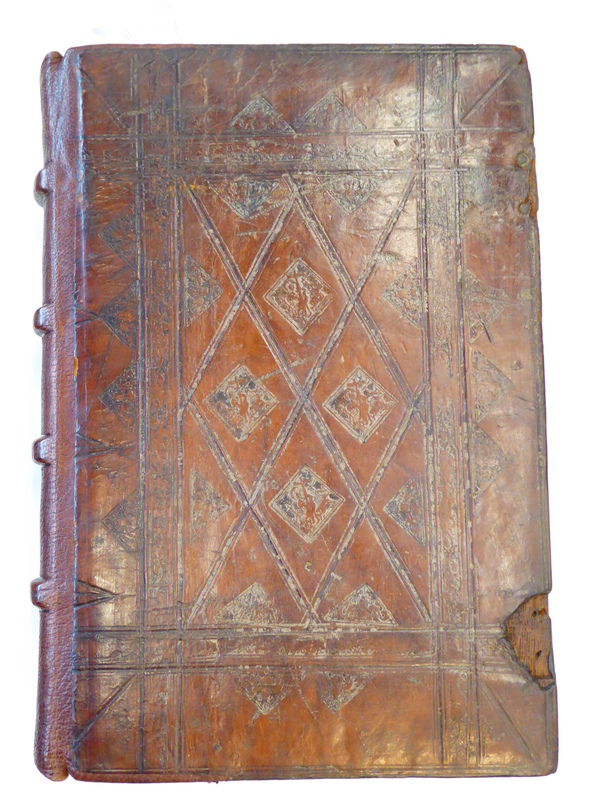 The destruction of manuscripts which saw fragments of former codices employed in bindings is particularly associated, in England, with the Dissolution of the Monasteries and the Protestant Reformation more widely. The decades from the 1530s were certainly one of the high points of this activity but it was certainly not the moment of its birth. Binders in this period were enlarging on established practice. 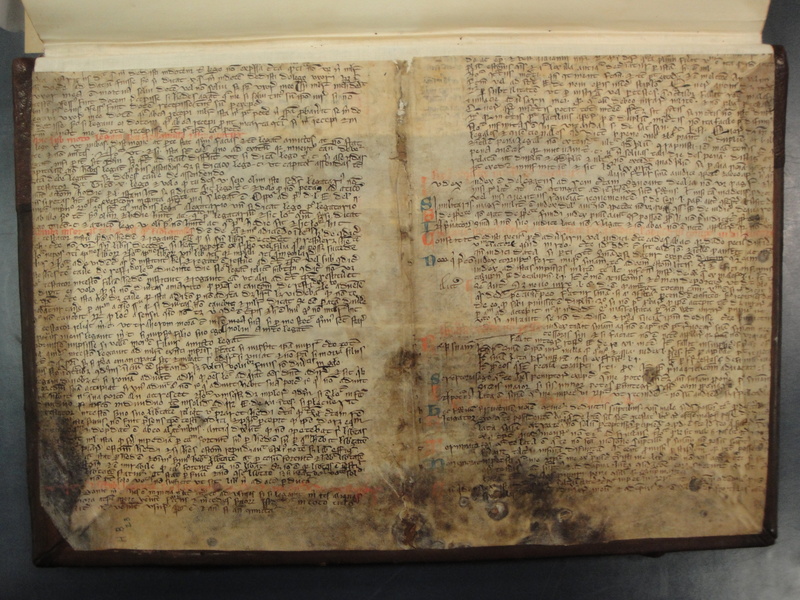 The presence of manuscript ‘waste’ within other manuscripts is a known phenomenon, and for the printed books bound in Oxford before the Reformation, Neil Ker in his Pastedowns was able to provide over fifty examples. They include one set of bindings which is in the Harsnett collection. The printed volumes provide the complete works of the fifteenth-century French theologian, Jean Gerson; they were published in Strassburg between 1494 and 1502. Their bindings, all in the same ‘diaper’ design, are identifiable as the work of the Oxford binder, George Chastelaine, who died in 1513. In other words, we know that the books were imported from the continent and were available in the university town for binding within a decade of the final volume’s publication. Within these bindings, there are remnants of two manuscripts. Both of them were quarto-sized, in each case a near-complete bifolium being needed to provide sufficient parchment to act as the pastedown to one of the printed volume’s boards. Neither is a visually attractive fragment – these had been working texts, written in low-grade scripts. What, though, were the texts that were thought to be dispensable in early sixteenth-century Oxford? 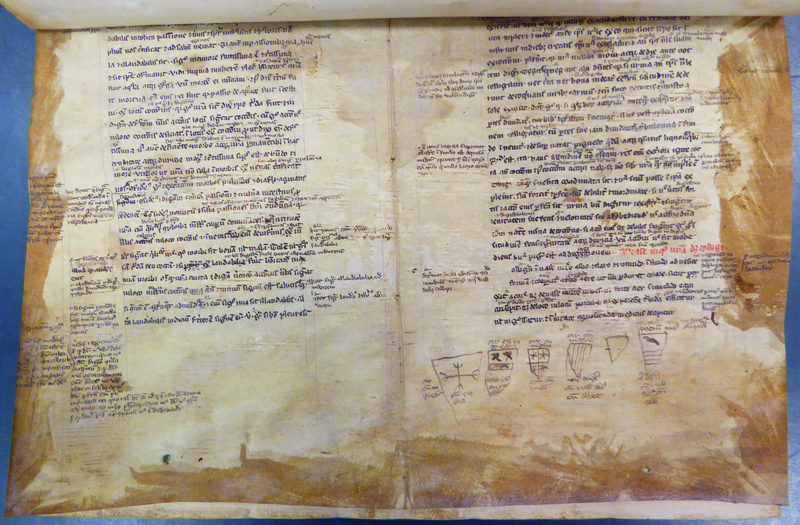 One of the works dismantled was a civil law commentary, with the copy dating from the later thirteenth century. 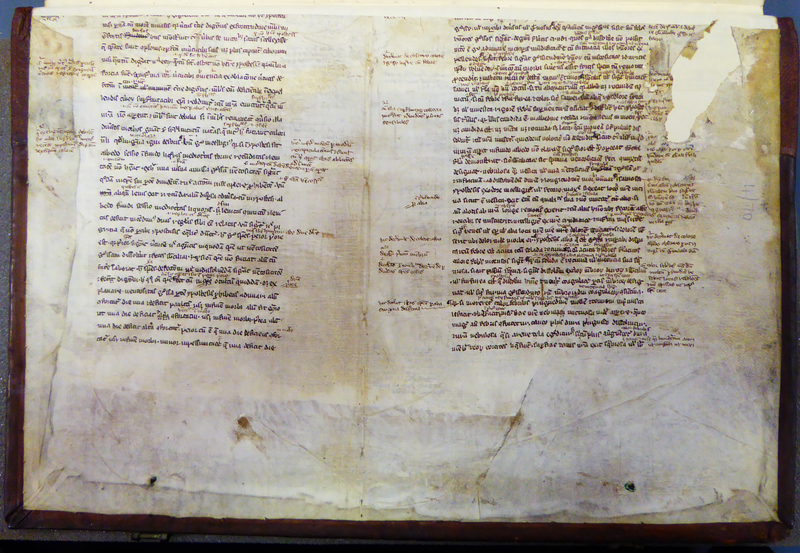 The other was from the same century and the Lost Manuscripts team have identified it as sections for Constantinus Africanus’s translation of the Liber urinarum by Isaac Israeli ben Solomon (Isaac Judaeus). It has the text in one column with intermittent glossing in the vertical and lower margins. Both texts continued to have usefulness at the beginning of the sixteenth century but these particular copies were clearly redundant. Indeed, in the case of the medical manuscript, disrespect for it had been shown long before it was dismantled: one of the fragments that survives has drawn in the lower margin of one folio a group of roughly drawn coat-of-arms with their charges in French. These appear to date from the fourteenth century and so suggest whoever had it in his hands at that point was less than fascinated by the text above the margin. It may well be that the previous doodling it had received made this manuscript more likely to be dismantled – perhaps we should be more surprised that this copy lasted for over another hundred years. It may be that it was not the texts themselves but their material state which made them vulnerable to destruction and reuse. Perhaps this habit changed with the larger-scale biblioclasm which was soon to follow. We must, however, say ‘perhaps’ because this is the significant question which cannot yet be answered fully: how far were the established practices of fragmentation transformed by the Reformation? Did the rationale change? Did the balance of texts to be cut up shift? Did the proportion of a manuscript to be reused alter? These are issues for which we do not yet have the data to reconstruct what happened. The intention, though, is that this will be remedied by later stages of this project so that we will be more fully able to watch the death of manuscript culture in action.